Please call the practice immediately so that we can arrange an appointment quickly. If it is outside normal practice hours ring 000 or call a hospital. You may leave a message on our answering machine for a call back inside office hours but this is not suitable in an urgent situation. Fractured teeth – can usually be restored so there is no need to panic. If the tooth is painful, avoid hot or cold and avoid eating or biting on that side i.e. relieve the tooth from extremes of temperature and pressure. Pain-free treatments are available by contacting us quickly for an appointment. Lost crown – Keep your crown safe so it can be re-cemented as soon as possible to avoid damage or the need for root canal treatment. Contact us immediately. DO place the tooth in cold milk (recommended for all ages) or on one side of your mouth between your teeth and cheeks (recommended for teens and adults). A dental abscess is an infection of the mouth, face, jaw, or throat that begins as a tooth infection or cavity. The cause of these dental abscesses is direct growth of the bacteria from an existing cavity into the soft tissues and bones of the face and neck. If you think you have an abscess, call our dentist. 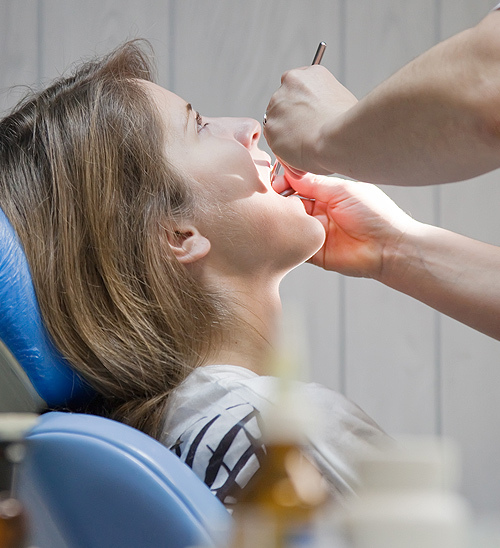 Our dentist can determine in a physical exam if you have a drainable abscess. X-rays of the teeth may be necessary to show small abscesses that are at the deepest part of the tooth. Please call our surgery for immediate advise and an appointment. An avulsed permanent tooth is one of the few real emergency situations in dentistry, a permanent tooth that has been dislodged can be replanted in it’s socket if the urgent emergency treatment has been sort in good time. Please call the surgery immediately for the correct advise or go to your nearest hospital if it is outside our opening hours.